My Dogs Love Me: What is it with Dogs and Ducks, anyway? What is it with Dogs and Ducks, anyway? Forget about squeaker balls and Kongs... our packs would kill for a piece of duck! And it doesn't have to be the real deal... just a stuffed plush animal that squeaks. Chooey has two of them. This is Ducky 1 being taught how to potty in the news paper potty area. Last June, my sister's sons decided to bring the pack some really special toys. 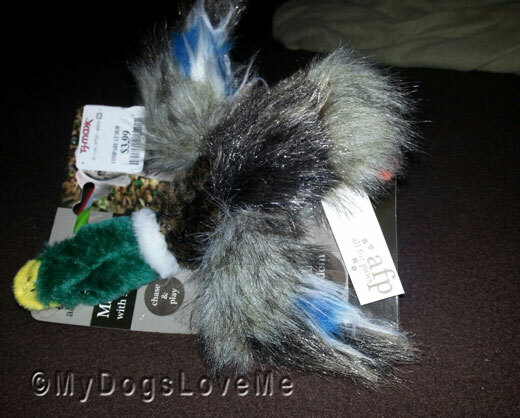 This All for Paws Mallard Dog Toy is still one of Chooey's most prized possesion. She squeaks it to death. And when we play the hunting game, I toss it up in the air for her to pick up like a super skilled retriever. This is how it looked like back when it was still BRAND NEW! Guess how many times this Mallard plush toy's been torn and sewn? So our question is, who actually chooses the toys? Is it really the dogs? Or is it the mom and dad? It's the peeps around here who chooses. The shops take a dim view of us testing out their stock. Those duck toys look adorable. I think Mom and Dad go for the first selection and the dog then (dis)approves of it. Def peeps chooses the toys but we know what we like and there is no fooling us. We like ducks and grouse and all kinds of fowl. Have a tremendous Thursday. Tisu Tandas means toilet tissue. Me and Stanley play with almost anything! I think the dogs show us what their favorites are over time, and then pick from there. While all my dogs' tastes are varied, and we don't have any duck fiends right now, our past Dobe loved stuffed ducks, carrying them around and sucking on them like they were some sort of weird pacifier! My humans choose my toys, they know what i like anything with a squeak that I can Kill. It always puzzles me how my dogs will love some toys and others they just sniff and walk away and never come back to it. Price has nothing to do with it. Some of their most expensive toys are untouched. We're having massive spammer problems too. 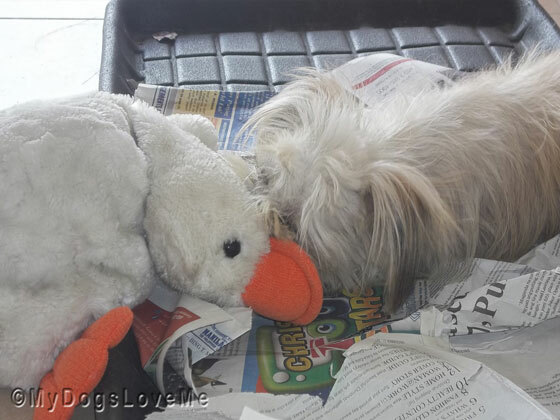 I wish I had that duck toy! He is cute! Those ducks look pretty special and like lots of fun...but nothing beats the White Dog Army's favorite treat...REAL duck jerky!